Snowcrest est situé à l'extrême sud de la montagne Snowshoe. Ce 1 bien meublé condo. À distance de marche supérieure Flume et Widowmaker pistes et à proximité des restaurants. Lit Queen, canapé-lit queen et lits superposés portes en verre coulissantes au balcon. Hot Tubs au premier étage du complexe Grande salle de «rassemblement» avec cheminée en pierre et salle de jeux. Je transmettrai cela à l'invité avec un rapport des accusations de VRBO. Fair place to stay, updating needed in this property and needing to bring toilet paper is a bit much for the price we paid. It was a quiet place and we all fit. It does sleep 6. Shirley was great and easy to work with. The condo and Snowcrest are both dated and could use some updates. I booked last min and paid Soaring Eagle prices without the ski locker, underground parking, nice lodge and great hot tub facilities. A towel rack fell when I brushed up against it, shower head was Old and weak....and the cables for the TV look like a college dorm. Not sure who would/could sleep in the bunks as my son 13 just slept on the couch. Met the maintenance guy downstairs and he offered to fix the towel rack immediately but I told him to address it after we left. Super nice guy. On the positive side, the bus drops you off at the front door, the TV had Netflix and many other services to choose from....Snowcrest was pretty quiet to go to bed at 10 after a long day skiing. A few upgrades/money spent would make it a great place....but it was kind of what seems to be normal at Snowshoe....dated. Thank you for your review. This unit was painted 2 years ago and new carpet and laminate was installed. The sleeper sofa is new this season also the dishwasher and TV is new. I will get someone to straighten out the cords. This condo fit our needs perfectly. It was clean and check out was a breeze! 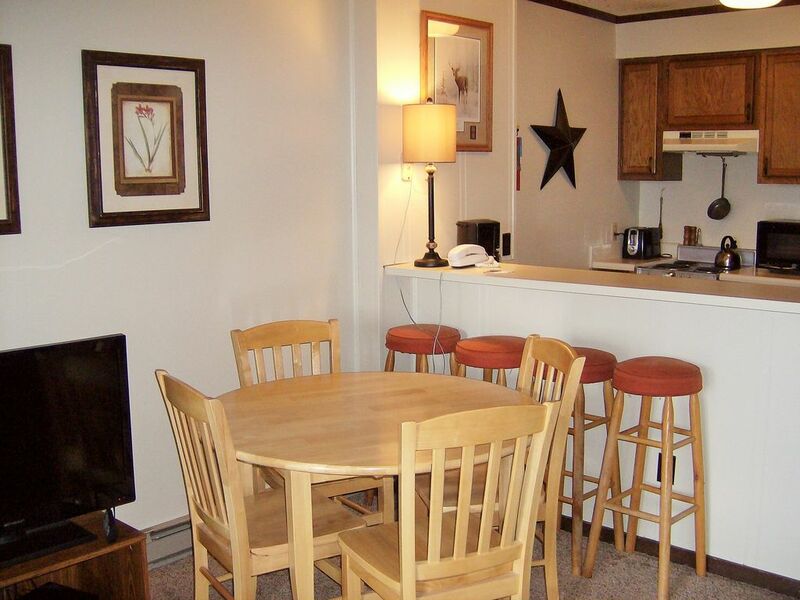 Shirley was very responsive whenever I had a question, and the condo is within walking distance to the slopes. Plus the shuttles pick up and drop off right outside the front doors of the building which was very convenient. We love Snowshoe, and this was definitely our favorite place we have stayed so far. The condo was very enjoyable. We were able to walk out and either catch a bus to the nearby slopes or walk several hundred yards to a slope. Would use this condo again. Great for a ski weekend, good location, totally suitable. Enjoyed the quick stay. Was a good location for snowboarding and had all we needed. Slightly dated decor. Couch is well used lacking support. Did not realize because I did not book through Snowshoe I am not eligible to use the hot tub and large pool in center of Village. Occurred a fee of 10 and $15 per person for usage. Got charged a damage charge of $34. Not sure what it's for. But all in all it's a clean and usable place with comfortable beds. Update to contact the trailer the charges for credit card fee that's passed on from vacation rental by owner. If you contact her directly you can avoid this fee as well as the service fee on the contract. I highly recommend that.